And adds contributions from former Telltale writer Emily Grace Buck as a Kickstarter goal. Back in August, I wrote about The Waylanders, a time travel RPG that clearly has its roots in older RPGs. Last week the game landed on Kickstarter, and it's generating substantial interest. It's almost exactly a third of the way towards its goal of $150,000 at the time of writing, gathering $47,320 in pledges. In The Waylanders' story, your characters time travel between the Celtic and Medieval eras, reincarnating in each. I got to try a brief demo, and it felt like the combat in particular had a lot of potential. You select character abilities using hotkeys and control members of your party individually, but you can also order the foot soldiers at your disposal into various formations. You might form an orb, for example, which moves your troops into an impenetrable dome of shields and spears, or an arrow head, which is useful for charging enemies down. There will be 12 formations in total, and you have to figure out how to get the most from them. Gifs on the game's Kickstarter page show how you might use the orb to block a corridor so enemies can't pass through, for example, while your mage aims fireballs at them from a distance. Hopefully, this range of combat styles will give The Waylanders a lot of interesting on-the-fly strategic options. If you feel like no one's making an RPG in the pre-Mass Effect but post-Infinity Engine style, this might be your sort of thing. 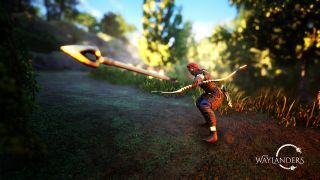 The Waylanders comes from Spanish studio Gato Salvaje, and former Dragon Age creative director Mike Laidlaw is also involved with the project. Among the game's stretch targets, too, is another familiar games industry name: Emily Grace Buck, former narrative designer at Telltale Games. If the game reaches the $200,000 mark, she'll join the project. The Kickstarter campaign ends on November 16.